This book made me furious. Mostly at my own naivete and head-in-the-sand, privileged optimism. I had no idea how corrupt our legal system can be and how easily it is manipulated to exploit minorities and the poor. Seriously, no idea. This white suburban middle-class bubble, it has thick walls. Bryan Stevenson is an attorney who founded a non-profit law firm in Alabama with the goal of reducing sentences or exonerating people condemned to death row. I hadn't thought much about the death penalty since reading Dead Man Walking as a high schooler, but damned if I can't stop thinking about it now. I hadn't ever felt comfortable with the idea, and if pressed, I'd have probably said I was against it, but now that I've read Just Mercy, I'm absolutely convinced. I could try to summarize some of Stevenson's best points here, but I'd never be able to do him justice. He's so eloquent and intelligent, you really owe it to yourself to read the book. 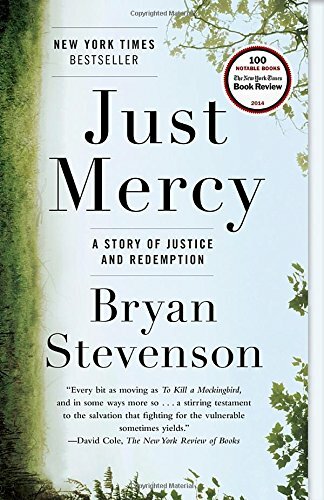 It's amazing to me that Stevenson, as someone who has dedicated his life to representing people whose lives have been ruined or ended by unjust punishments, was able to write this book in such a calm, measured, gracious tone. Even setting aside everything his clients have been through, Stevenson has, as a black man, found himself on the receiving end of infuriating harassment and prejudice. Still, despite all that, every day he somehow finds the energy to go fight for justice for his clients. To have hope in the face of all that he has seen must require great faith—in God, in his moral code, in the power within each person to choose good? I'm not sure exactly where Stevenson's faith springs from, but it inspired me, even as his stories made me want to throw in the towel on his behalf. How do you fix a system this broken, full of broken people on both sides of the bars? The best thing about Just Mercy is its underlying message of hope. That fighting on the side of good matters, even if good doesn't win them all. I have to admit to some cynicism about that. But I desperately want to believe it, and people like Bryan Stevenson help me find courage to keep showing up and doing the work.